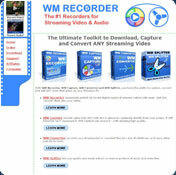 WM Recorder Pro is one of the most easiest and advanced way to record and playback video and audio from the Internet. Just open the recorder play the video or audio from your Internet Explorer browser or your favorite media player and the content will automatically be recorded. While extremely simple to operate WM Recorder provides a variety of advanced recording and processing options. Some of these options in particular the AUTO recording, Real Time recording and multiple channel Preview are unique to this program. · Automatic Recording - With the AUTO option set recording begins automatically when you play the video or audio. Not even one mouse click is required. · URL's can be captured and saved using the Real Time recording modes. · Scheduled Recordings - schedule up to 50 recordings. · Multiple Recordings - simultaneously record up to 50 streams. · Password Protected Content - record content that require password authentication. · File reprocessing, fixing, editing and organizing. · Internet TV, Internet Radio, Video and Audio tested and updated links. · The demo version allows 10 minutes of recording and up to 5 recordings at a time. Restarting the program gives you more recording time. You cannot download any crack or serial number for WM Recorder Pro on this page. Every software that you are able to download on our site is legal. There is no crack, serial number, hack or activation key for WM Recorder Pro present here. Our collection also doesn't contain any keygens, because keygen programs are being used in illegal ways which we do not support. All software that you can find here is freely downloadable and legal. WM Recorder Pro installation package is prepared to be downloaded from our fast download servers. It is checked for possible viruses and is proven to be 100% clean and safe. Various leading antiviruses have been used to test WM Recorder Pro, if it contains any viruses. No infections have been found and downloading WM Recorder Pro is completelly problem free because of that reason. Our experts on malware detection tested WM Recorder Pro with various spyware and malware detection programs, including fyxm.net custom malware and spyware detection, and absolutelly no malware or spyware was found in WM Recorder Pro. All software that you can find on our servers, including WM Recorder Pro, is either freeware, shareware or open-source, some of the software packages are demo, trial or patch versions and if possible (public domain licence), we also host official full versions of software. Because we want to be one of the fastest download sites on the web, we host all the software including WM Recorder Pro on our servers. You cannot find here any torrents or download links that would lead you to dangerous sites. Rate WM Recorder Pro 7.1!